Suppose the measure of angle A is x. What would the measure of angle B be (in terms of x)? Again, suppose the measure of angle A is x. What would the measure of angle C be (in terms of x)? Take your responses to the first 2 questions and write an equation, in terms of x, that expresses the relationship among the 3 angle measures of this triangle. What is the value of x? 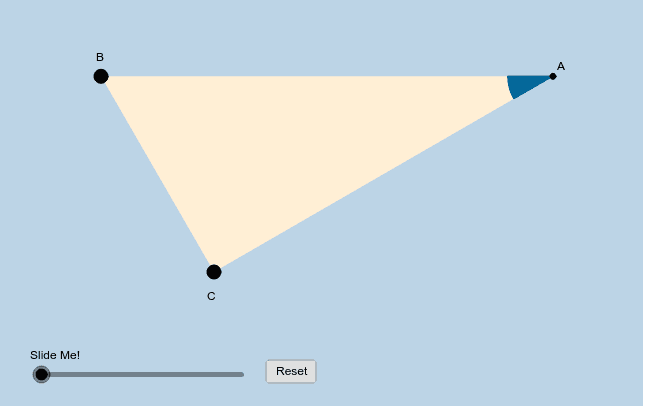 What are the measures of this triangle's 3 angles? How does the length of the hypotenuse of this triangle compare with the length of this triangle's shorter leg? Suppose the shorter leg's length (BC) = 4 cm. What would hypotenuse AB be? Suppose the shorter leg's length (BC) = 4 cm. What would longer leg AB be? Suppose short leg BC = 5. What is the length of long leg AC in simple radical form? Suppose Hypotenuse AB = 5. What is the length of long leg AC? Suppose long leg AC = 10. What is the length of short leg BC in simplified radical form?